The Titanium Plus trim of the new Ford EcoSport was so far available only with a six-speed automatic gearbox in combination with the petrol engine, which is a much-requested combination according to Ford. Ford India has added a new variant to its popular compact crossover - the Ford EcoSport. The new variant will bring the entire feature set of the EcoSport in combination with its petrol engine and a six-speed manual gearbox. As a result, the new Titanium Plus is now the top-of-the-line offering from Ford's stable, and the company claims that many of its customers have enquired about the availability of a top-trim petrol-powered manual gearbox variant of the new EcoSport since it has been launched. The Titanium Plus variant of the new Ford EcoSport was initially offered with a six-speed manual gearbox in combination with the 1.5-litre TDCi diesel engine, and a six-speed automatic gearbox with the new 'Dragon' series, 1.5-litre, three-cylinder petrol engine. The diesel engine produces figures of 99bhp and 205Nm torque, while the petrol engine produces 121bhp and 150Nm torque. This new, naturally aspirated Dragon engine replaces the old 1.5-litre, four-cylinder and 1.0-litre EcoBoost petrol engines in the previous edition of the EcoSport. The Titanium Plus majorly emphasises on safety, with some of its key features including hill start assist, electronic stability control, traction control, emergency braking assistance, six airbags, ISOFIX rear child seat mounts, rain sensing wipers, automatic headlamps and tyre pressure monitoring system. 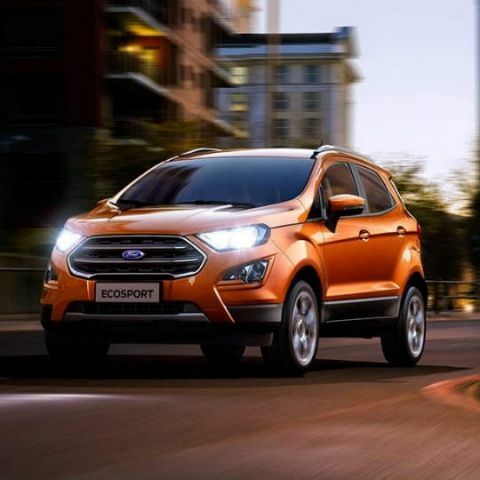 Ford's new petrol engine, which features in the new EcoSport, has been hailed as an able performer that focuses on ride quality, stability and performance, and it is this that Ford has targeted to provide along with the entire feature set of the new EcoSport. The 2017 Ford EcoSport Titanium Plus petrol manual variant has been priced at Rs. 10.47 lac (ex-showroom, pan-India), considerably less expensive in comparison to the Titanium Plus AT variant. It also features Ford's new SYNC 3 infotainment system with Apple CarPlay and Android Auto onboard.